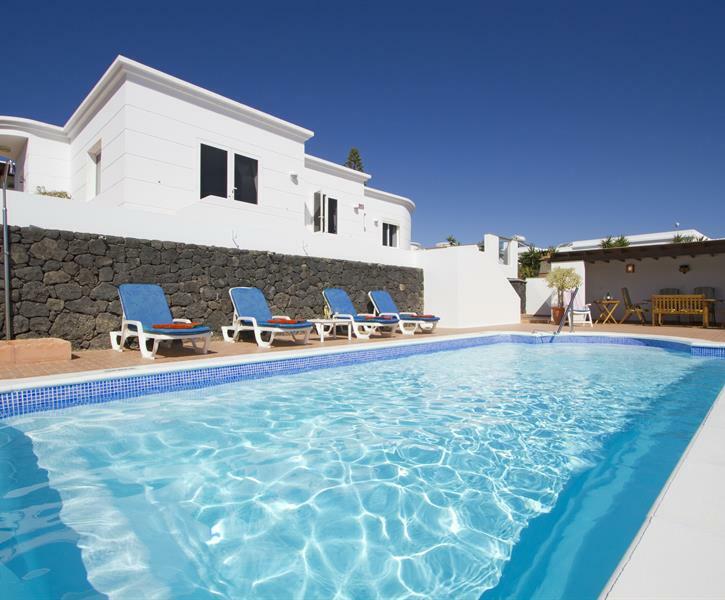 A luxurious three bedroom villa with heated salt water swimming pool just eight minutes from Arrecife airport. Casa McElroy offers extremely spacious accommodation and its elevated. An incredible property with the most amazing views we have ever seen. The property is like a maze and every corner and curve defines the design of the building which as been well thought of for individual space and needs. The owners Norman and Hillary clearly pride themselves in the maintenance of the property. Due to reasons that one could list, we got delayed and walking in to the property with the alarm turned off and the porch light on was a welcoming to the start to our holiday. The owners have ensured there is a managing agent on site for any reason. The pleasure of meeting Lynne who managed the property was a bonus to our stay, not only did Lynne work around our needs but the simple things that matter, such as the alarm turned off and light put on, one could not ask for a more home to home stay with the lovely views and the weather. If you want the peace and quite with everything one needs, this is the place to be. Luxurious villa situated in a peaceful setting with spectacular ocean views.Spacious accommodation, clean and well maintained has been tastefully decorated. Short drive from the airport was a bonus. With consideration to modern living, excellent internet access allows ease of contact with friends and family. Panoramic views from indoors gives a feeling of al fresco even when indoors. The outdoor space is extensive with a variety of areas to suit your mood whether that be reading a book in a shady corner, doing yoga or excercise on the extensive terrrace, or dozing in the pergola after some water aerobics, in the very inviting heated pool or simply soaking up the rays poolside. Despite the peaceful location, the local supermarket is convenient well stocked. The barbeque area is ideal for those nights you just cant drag youself away from the poolside. The beautiful beach at Playa Honda/Guacimeta is about 10mins away by car, with a great promenade for a stroll, running, skating or cycling. This area is busy both by day and by night with a nice variety of coffee shops bars and restaurants. Among our favourites was Marilyns for a coffee and in the evening Casa Terre for tapas and La Barca for french cuisine . For those who just have to shop Arrecife is a picturesque city, set on the waterside also with a lovely beach. We enjoyed a trip to the Arrecife Gran Hotel where the glass elevator takes you to the coffee shop with panoramic views across the city, beach &sea. The new Marina in Arrecife has some nice shops and restaurants. Arrecife itself has some interesting shops and streets to explore. However the laid back atmosphere around the Charco, whether it be morning coffee, lunch or a late evening dinner is 'chillax' to a tee! Excellent customer service. Will definitely be recommending this to family and friends. Casa McElroy is a luxurious villa set on a lovely elevated site providing everything you need for relaxing pampered holiday. We especially like the lovely pool deck with heated pool and large pergola for al fresco dining and shelter from the sun when required. We hadden een heerlijke vakantie in een prachtig huis. Heel erg compleet, een lekker warm zwembad, een leuk uitzicht en goed centraal gelegen voor tochten over het eiland.